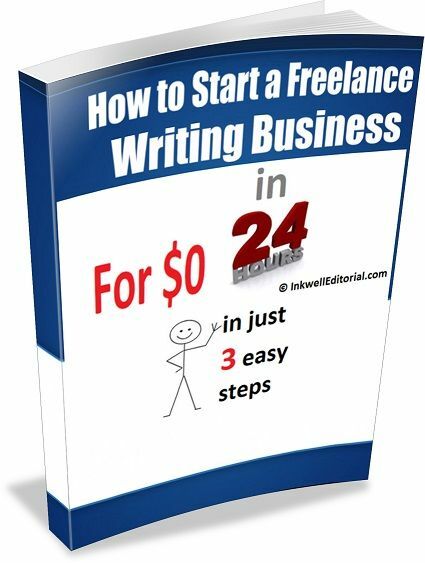 I receive anywhere from 5-10 emails a week (a couple a day), asking me the same question, “How do I get started as a freelance writer?” Well here's how -- in 3 easy steps, within 24 hours, for $0! Freelance writing is one of those home-based businesses that can literally be started for nothing. That’s right $0! And, that’s one of the reasons I think it appeals to so many. I've been a freelance writer since 1993. Via my blog, InkwellEditorial.com, I receive anywhere from 5-10 emails a week (a couple a day), asking me the same question, “How do I get started as a freelance writer?” The short answer is to just do it. Are You Making Any of These Excuses for Not Starting Your Freelance Writing Career? You’ll learn how to overcome all of these obstacles – and more – in this ebook. You see, unlike a lot of home-based businesses that require long-term planning, business registration, equipment purchases and a host of other time and money-consuming issues, this one doesn’t. Making a success of a freelance writing business does require some work – and don’t believe anyone who tells you any different. I just wanted you to realize that. I’ll tell you EXACTLY what to do to get your freelance writing career up and off the ground -- in less than one day. Really! Following is a complete table of contents.